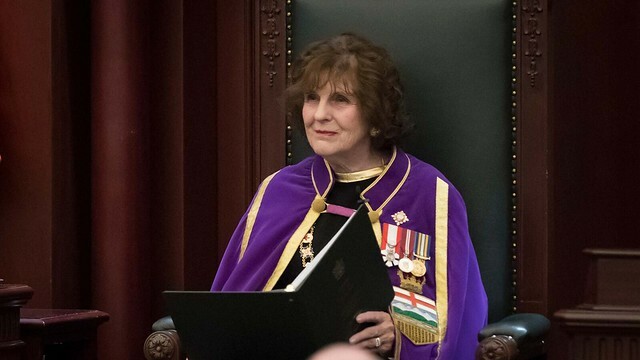 The fifth session of the 29th legislature opened with a speech from the throne delivered by Her Honour, Lois Mitchell, CM, AOE, LLD, Lieutenant Governor of Alberta. Welcome to this, the first day of your legislature. We gather today on the traditional territory of Treaty Six and acknowledge the Métis people of Alberta, who share a deep connection to this land. In this chamber and throughout this province, we are proud, humbled and blessed to be Albertans. Alberta is a beacon of hope, opportunity and justice. On these 662,000 square kilometres in northern North America, we have built one of the world’s great societies – 4.3 million of us, from all walks of life and every part of the globe. We have different aims in life and hold competing political viewpoints, but we are joined by universal values, such as freedom, equality and justice. In Alberta, it doesn’t matter who your parents were, where you went to school, whom you love or to whom you pray. All that matters – all that should matter – is the content of your character. Now, of course, building a great society this far north, in these temperatures, has not always been easy. From this land’s first inhabitants onward, it has taken incredible determination and foresight. And we have been tested many, many times. We are reminded of that every time we walk past the Wall of Honour in this legislature commemorating lives lost in war. We are reminded of that whenever we listen to our fellow citizens who lived through the Great Depression. We are reminded of that every time – with increasing frequency – our harsh climate takes its toll with floods, droughts and fires. And we are reminded of that every time an economic boom turns to an economic bust – a cycle that is all too familiar and frequent. It’s on this last point that I would like to reflect for a moment. When your government was elected in 2015, Alberta was in the midst of one of the most dramatic oil price collapses in generations. A boom had turned to bust, tens of thousands lost their jobs, billions of dollars were being bled from the treasury, and Albertans tasked a new government with steering us through and protecting what matters. For decades, governments in Alberta responded to economic busts in a predictable way. And everyday Albertans paid the price. The middle class got squeezed and the most vulnerable were left behind. One Alberta for the few. Another Alberta for everyone else. This time, however, with a new government in Edmonton, things would be different. Everyday Albertans – our families, our communities, our jobs – would come first. Your government would not pay lip service to honest government and then build Sky Palaces. We would clean up government and put democracy back in the hands of the people. Your government wouldn’t just talk about economic diversification. We would do something about it. Your government wouldn’t just get angry about pipelines. We would fight for them with a determined and strategic plan to build a national consensus. And every step of the way your government would defend our schools, hospitals and public services, while keeping Alberta’s budget on track to balance. For too long, governments in Alberta worked for political insiders, well-heeled special interests and the super rich. We set out to fix this. Corporate and union donations have been banned, laws around lobbyists have been strengthened, and we have increased transparency across government. Politician travel and hospitality expenses have been slashed by 80 per cent. Millions of dollars in waste and entitlements have been cut, such as taxpayer-funded golf club memberships and way-out-of-proportion salaries for CEOs of government agencies. Today, thanks to determined efforts to invite more Albertans to apply, Agencies, Boards and Commissions are now more diverse, with an equal number of women and men. We have also sought to provide more budgetary information to the public. According to the C.D. Howe Institute, Alberta today is one of only two provinces to receive top marks – an A+ for two years in a row – for fiscal transparency and accountability. The message is clear: Your government is here to work for you, not for itself. Sky Palaces are part of our past, not our future. Over the next year, we will introduce new measures that will further strengthen democratic reform and make sure democracy in Alberta belongs to all. Let’s turn to your government’s efforts to create good jobs. From Day 1, we have worked to help our economy recover and make sure everyone shares in the recovery. With people in need of work, interest rates low and much of our provincial infrastructure still in need of modernization or replacement, we put people to work building Alberta. As a result, our province is on a stronger foundation. Across the province, the schools our kids go to are better equipped to help them meet the challenges of the world ahead. From Grande Prairie to Medicine Hat, Lethbridge to Slave Lake, more than 240 badly needed schools have been built or upgraded. The hospitals our loved ones need when they are sick or injured have benefited from strategic new investments. The Calgary Cancer Centre is well underway and a new hospital is under development for Edmonton’s growing south. We are improving patient safety and shortening wait times by fixing our deteriorating lab system. Work on a major new high-tech lab is now under way, which will benefit Albertans for generations. We are building long-overdue water infrastructure to help ensure that First Nations in Alberta have access to clean, safe, reliable drinking water. It is a disgrace that this work failed to happen during the last oil boom. We are repairing and building nearly 4,700 affordable homes for seniors and people in need, exceeding our original commitment and helping to make sure everyone can count on a roof over their head. And thanks to a forward-looking Capital Plan, highways, bridges, light rail and interchanges are creating good construction jobs, helping people get around more easily and unlocking economic potential in exciting and growing areas of our province. As we look forward, we are continuing to build Alberta for the future. Your government will continue to make sure our kids learn in safe, modern classrooms by moving forward with building, expanding and modernizing more schools. With our population growing and more kids entering our public schools every year, we have to keep looking forward and funding the construction of new schools. This includes fully funding long-awaited projects, such as a major new high school in north Calgary. This year we will move forward with a badly needed expansion of the Red Deer Regional Hospital. This work will expand the emergency room, establish a cardiac catheterization lab, and expand other services to ensure this vital part of central Alberta is ready to care for generations of patients and families. In Calgary, the Peter Lougheed Centre has one the busiest emergency rooms in the province and needs renovations to ease congestion. We will fix this problem, with renovations to the emergency, mental health and laboratory spaces. A new children’s mental health hospital in Edmonton will move ahead, helping kids from across our north. In Calgary, your government will make major improvements to Deerfoot Trail, reducing congestion and improving safety for travellers. We are committed to keeping the people of Calgary safe, which is why we will continue to invest in crucial flood mitigation work, including the Springbank Dam. We will continue to build more affordable and supportive housing. Building on Alberta’s first-ever affordable housing strategy, over the next four years we will build and repair 4,000 more affordable housing units. We will increase and accelerate our work to make sure every First Nation in Alberta has clean, safe, reliable drinking water, delivering this vital human right faster to more communities. Finally, for a modern province like ours, rural broadband should not be considered a luxury. It is a necessity and we will invest in a rural broadband strategy, helping people in rural areas get the same fast, efficient internet services as people in urban centres. While your government has worked to help Albertans recover from the oil price crash, we have also worked to defend the jobs of our energy workers and defend the value of our resources. Your government has fought to get new pipelines built but, due to the failures of successive federal governments, Alberta’s resources remain landlocked. Canada’s inability to build new pipelines is costing the entire economy – both within Alberta and across the country. Albertans know this, and the frustration this issue has caused for workers and families is real. To be sure, despite setbacks, we remain firm in the belief that the Trans Mountain Pipeline will get built, and we will not let up until it gets built. Trans Mountain remains in play because we compelled the federal government to step up and buy it. Through a strategic and determined effort, with the facts on our side, we have travelled the country, working to build a durable national consensus on the need to build new pipelines. When we started, a minority of Canadians supported the need for new pipelines. Today, a strong and growing majority of Canadians agree we need new pipelines, and that includes a majority of our neighbours in British Columbia. In the best interest of all Albertans and all Canadians, your government will continue to keep the pressure on, keep Canadians informed and get Trans Mountain built. In the meantime, we are not sitting around and waiting. Our lack of export capacity caused major backlogs of our resources. In extensive consultation with industry, your government had to take the temporary action to curtail oil production. We cannot remain in this position and must end the curtailment as soon as possible. As the market responds and conditions change, we will continue to allow production to increase. To help make sure the backlog continues to decline, we signed an agreement to help Alberta producers ship more oil by rail. We did our homework, consulted widely and, when the differential crisis hit, we were ready to respond. Beginning this July, we will lease up to 4,400 rail cars, moving an additional 120,000 barrels a day. The importance of this deal became even clearer recently when it was announced that Enbridge’s Line 3 replacement would face a new, six-month American delay. Not only will this investment make money for Albertans, it will help people get back to work, it will help us get production up, so we can bring curtailment to an end, and it will do so without affecting shipments of our agricultural goods. In addition to fighting for pipelines, your government has a duty to get every last bit of value from our resources. After receiving recommendations from two expert panels, last spring we established our Made-in-Alberta energy diversification plan – the single largest energy diversification effort since the days of Premier Peter Lougheed. We put $3.5 billion on the table and said to investors, show us a responsible, fully costed project, a validated plan with a clear return on investment, one that gets more value from our resources, and we will work with you. With only the first third of that plan – $1 billion in royalty incentives and loan guarantees – we have leveraged nearly $13 billion in new private-sector refining and upgrading investments in Alberta, creating more than 8,500 new jobs. That’s exactly what we want to see in Alberta. Let’s stop burning our resources for nothing and start delivering on the full potential of this province, with more refining, more upgrading, more value and more good jobs for people across our economy. In addition to getting more value for our resources, we are actively diversifying, with industries such as high tech, manufacturing, tourism, film and television, agri-foods, renewable energy and more. Much work has gone into this important task. We cut the small business tax by a third, provided access to capital during the downturn to help businesses hire and expand, introduced a range of tax credits for entrepreneurs and we have maintained Alberta’s $11 billion tax advantage over the next lowest taxed province. In agriculture, we are helping the Agrivalue Processing Business Incubator expand, which will make it the largest centre of its kind in the world. Our manufacturing sector is strong and growing, with the Conference Board of Canada forecasting 8.8 per cent growth for Alberta manufacturers this year. Building on Alberta’s strengths in the health, environment, energy, food, forestry and emerging technology sectors, Alberta Innovates continues to help researchers and entrepreneurs grab hold of new opportunities. Today, thanks to the Climate Leadership Plan, Alberta is the most sought-after market in Canada, if not on the entire continent, for renewable energy investments. By 2030, we will see 5,000 megawatts of green electricity generation, about $10 billion in new private investment and the creation of 7,000 jobs. And finally, your government is taking significant steps to secure Alberta’s place as a global high-tech leader. Researchers in Alberta are ranked third in the world in artificial intelligence and machine learning, Google DeepMind has built its first lab outside of England, right here in Edmonton, and other key, global high-tech companies have set up across the province. To build on this momentum, we are investing $100 million in a technology diversification plan and following through on our five-year plan to create 3,000 new high-tech training seats in our universities and colleges. Finally, we must make sure Alberta remains a place that works for everyone, with strong schools, hospitals and stable, reliable public services. But strong public services require sound fiscal planning. That’s why we provided stable, predictable funding to public services, laid out a responsible and achievable path to balance, and prevented reckless cuts to schools, hospitals and the services people rely on. As of the province’s third-quarter report, the deficit is down by $1.9 billion – beating our targets for the second quarter in a row and the second year in a row. We remain on track to balance the budget by 2023, with the best balance sheet in the country. And we are doing this without making reckless cuts to the services all Albertans rely on. We will continue to stand up and say “No” to American-style health care. And we will keep our hospitals and health centres available to everyone who needs them. Today, Alberta has more nurses and doctors working than ever before. We cancelled unfair health premiums. We have increased home care and community care, and can officially advise Albertans that we have met our commitment to build 2,000 long-term and dementia-care spaces. In Fort McMurray, after years of false starts and political wrangling, we stopped the dithering, made a decision, picked a location and finally got shovels in the ground on the new Willow Square Continuing Care Centre. We have opened new hospitals in Edson and High Prairie, and opened dialysis units in Whitecourt, Lac la Biche, Hinton and elsewhere. Families in Airdrie now have access to 24/7 urgent care and we have expanded care in many other communities, such as Sylvan Lake. We have significantly expanded mental health and addiction services and we are transforming the way primary care is delivered in Alberta. We have brought in tough new laws to protect women seeking important reproductive health services, such as abortions, making sure others cannot film them, heckle them or intimidate them. We are investing to put more ambulances on the road and make sure our EMS professionals have the tools and training they need. At the same time, we have significantly reduced wait times for breast cancer surgery and we have among the best wait times in the country for radiation therapy and hip fracture repair. This year, your government will introduce new measures to reduce wait times, strengthen the rights of women to get critical health services and reduce the costs seniors pay for the drugs they need. Finally, Bill 1 before this legislature will be An Act to Protect Public Health Care. This act will strengthen our ability to defend Albertans from American-style health care creeping into our province. In addition to defending public health care, we are also defending public education. Rather than cutting classroom supports, we invested in our classrooms, our teachers and in relevant, modern education. It matters that our kids have a firm foundation in the basics, such as mathematics and writing. It matters that our kids are provided with a science education that prepares them for a rapidly changing world, including the real and present threat of climate change. It matters that our kids leave school with an understanding of our history as Canadians, especially the importance of Truth and Reconciliation with Indigenous Peoples. And it matters that all our kids can feel proud of who they are and feel safe at school. That’s why we are working with parents and educators to bring our curriculum out of the pre-internet age. That’s why we funded enrolment growth and put 4,000 new teachers and support workers in classrooms. We reduced school fees for parents, saving families more than $50 million, and made sure our schools are safe and inclusive for everyone, especially for those who identify as LGBTQ2S+. And when our kids graduate from high school, if they choose to go to university or college, we have made sure there is an affordable, accessible space for them in one of Alberta’s world-class post-secondary institutions. Where once we were the most expensive province in the country to get an advanced education, now we are among the most affordable. This year, your government will help more Albertans get their high-school diploma as well as the English Language Learning training they need to get a great job. And we will bolster Alberta’s Classroom Improvement Fund to make sure our classrooms are able to respond to the specific needs of each and every young student. Not only are we taking steps to make sure public education is defended and post-secondary education is accessible, we are also making child care more affordable for families. Just a couple of weeks ago, we saw reports that ranked child-care costs in Alberta as some of the highest in the country, often exceeding rent costs and mortgage costs. They are a major roadblock for a lot of young women who want to rejoin the workforce after having a baby. That’s why we established a $25-a-day child care pilot program and expanded it to 7,300 spaces across 122 licensed child-care centres. But even still, child care is far too expensive for far too many women and families. That’s why, this year, your government will undertake a major new program to help young mothers and families save thousands of dollars and help make child care more affordable for everyone. And finally, we will continue our efforts to eliminate child poverty in Alberta. Statistics Canada recently reported that Alberta’s child poverty rate has been cut in half since 2015 and is now the lowest in the country. Forty-four thousand kids have been pulled out of poverty. That’s 44,000 kids who have safe housing, good food on the table and the means to afford warm mittens and parkas. Importantly, this poverty reduction work happened during the toughest recession in a generation. It happened because your government remained steadfast in our commitment to help people who need help the most. We brought in game-changing poverty reduction measures, such as the Alberta Child Benefit and the enhanced Alberta Family Employment Tax Credit, both of which put thousands of dollars into the pockets of young families. We increased financial supports for Albertans receiving AISH, Income Support and seniors benefits, legislatively tying those supports to the rate of inflation. We brought in a school nutrition program to make sure more than 30,000 students in elementary schools get a healthy meal. After being tied for the lowest minimum wage in the country, Alberta workers now have the highest minimum wage, at $15 an hour. This is of significant benefit to women and young families. In fact, two-thirds of minimum wage earners in Alberta are women, many of them with kids. Even with this progress in reducing child poverty, one child in poverty is one child too many, especially in a province as resource rich as Alberta. Your government is committed to lifting every single child out of poverty. We are stronger when we stand together – as one Alberta – hopeful and optimistic. Together, we have done away with the entitled, broken politics of the past. Together, we are taking control of our future, breaking away from the devastating cycles of boom and bust and setting our province on a more diversified, modern and resilient foundation. Together, we are tackling poverty, supporting education, making sure patients in our hospitals get the care they need – and we are doing all of this while staying on a clear and responsible path to a balanced budget. We cannot – we must not – allow two different Albertas to form: One for the wealthy and one for everyone else. Let us always honour the hard work of our parents and grandparents, work that built our modern democracy, defended it against outside threats and developed our resource wealth. Let us honour the traditions, wisdom and rights of the Indigenous people of this land. Let us, too, honour our financial, environmental and democratic obligations to our kids and grandkids. The resources in our ground are tremendous and will generate wealth and prosperity for decades. But let us always remember that those resources pale in comparison to the resources beneath our hats, our turbans, our head scarves and our head dresses. With the priorities laid out in these remarks – restoring trust in government, creating good jobs in a more diversified economy, and defending the schools, hospitals and public services that workers and families rely upon – we can raise one another up, making sure we are all able to see that same hopeful and optimistic horizon. We stand as one, Albertans to our very core.